Prerequisites Have completed Arcade Action - Creating a Custom Character lesson. Typically, it’s not considered a good thing when ships just fall from the sky. Since this game uses a custom character, the way that character moves needs to be created. This specific ship will move whenever the player presses a keyboard button and always point at their mouse. To get the ship moving, you’ll use a VectorForce object to act as the engine of your ship. VectorForce objects push whatever they are attached to in a straight line. If you attach one to the HumanoidRootPart, it can be scripted to push the ship towards the player’s mouse. Under the HumanoidRootPart, add a VectorForce object and an Attachment. Set the VectorForce’s Attachment0 to the attachment created last step. If you test right now, the ship won’t move because the controls need to be added through scripting. By default, players can only control the normal Humanoid avatar. Everything else is controlled by Roblox’s servers. Who controls an object, whether it’s the server or the player’s computer is referred to as network ownership. Players won’t be able to pilot the ship themselves until the server is told to give network ownership to the player, which the script below will do for you. Inside of ServerScriptService, add a Script. Copy and paste the code below into the script. -- Connect onPlayerAdded() to the PlayerAdded event. Roblox’s networking API can’t change the owner of a part unless it is in the workspace. Performing the while not loop will stop the server from setting the network owner until the player is fully loaded into the game. Before we start coding the controls, now is a good time to start talking about client vs server. There are two places a script can run from. One place is the Roblox server and the other is the client, a player’s computer or device. Script objects run on Roblox servers which helps make them more secure. Important game play features that you don’t want hacked, like awarding points, should happen on the server. The downside is that there can be lag while waiting for the server, and too many scripts running on the server will make the lag worse. Things that need to run lag-free, like player controls, should run on the player’s computer using a LocalScript. In general, if the code is something that only the player should see, code it in a LocalScript. If all players should see it, write the code in a Script. This LocalScript will allow players to control the ship by holding down a button and aiming the ship with their mouse. 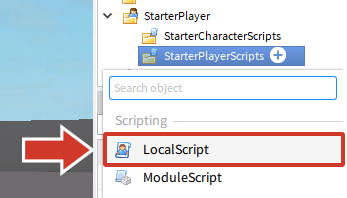 In StarterPlayer > StarterPlayerScripts add a LocalScript named ControlScript. --This script determines what functions to call when a player presses a button when playing. The script uses ContextActionService for player controls. ContextActionService is a service that lets scripts connect a player's input, like a keyboard press, to a specific action in-game like moving. Using this service also makes it easy to make a game playable on consoles or mobile devices. At the bottom of the script, add the variables for ship speed and controls. -- Sets the player's speed: The larger the negative number, the faster the ship will go. To change player controls, change the FORWARD_KEY variable. Type Enum.Keycode. to see a set of possible keys. The forward key act likes a gas pedal. While the player is pressing it, the ship’s vector force will go faster and faster. Releasing the key will stop the acceleration, but not the ship’s forward motion, just like a car. Test your code, press W to move the ship towards your mouse. The ship is alive! Your ship may move differently depending on the material you picked. If the material of your ship is something other than “Granite”, you will want to experiment with the value of PLAYER_SPEED. Granite parts are very heavy compared to other materials.